He was born on September the 27th, 1958 in Gobu Bilagharda village of Fizuli region. After finishing 8th grade in his native village, he entered Shusha Agricultural College. 1978 he began his career in Fizuli as a livestock expert. While at the College, he was engaged in sports such as wrestling and won the title of “Garabagh Champion” in the completion held in Shusha. In 1979, he joined the army. After being discharged from military service, he went to Aktyubinsk city of Kazakhstan republic and began his career in the Department of Internal Affairs. He did not forget to continue his education either. He entered Orenburg Polytechnic University and in 1986 he graduated from the faculty of the Transportation. Then he worked for the Department of Internal Affairs of Aktyubinsk city for 4 years. In 1990, he returned Home with the rank of lieutenant. Soon after, he was assigned as an inspector on duty in Fizuli region Department of Internal Affairs. Then, Police Patrol Squadron was established in Fizuli region. In March 1991, he was appointed as a platoon commander of the 3th regiment. Later, thanks to his good work he was given a second position – Chief of the BTR Crew (armored personnel carrier (APC)). He was fighting bravely along with his Platoon in the defense of Fizuli region. Their courage and bravery resulted in the destruction of many armenian militants and one of their Armored Personnel Carriers in Khalefshe village. Lieutenant Farzalieyv Pahlivan died heroically in heavy fighting for the village of Ghajar. He was married. He is survived by two sons and a daughter. 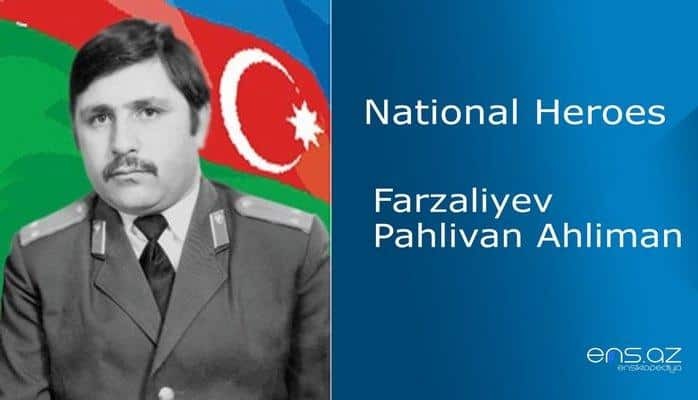 Farzaliyev Pahlivan Ahliman was posthumously awarded the title of "National Hero of Azerbaijan" by the decree of the president of the Azerbaijan Republic # 264 dated October the 8th, 1992. He was buried in the village of Gobu Dilagharda of Fizuli region. In one of the settlements in Baku is named after the hero.